Video playback for most YouTube visitors is just fine. They may run into the occasional issue but most of the time videos play without delays, stutters, buffering issues or local issues such as draining battery life, using too much cpu or causing everything else on the system to slow down while a video is playing. Some users of the site run into issues all the time on the other hand. This is not necessarily YouTube faults, not always anyway, as it may also be caused by bad routing and computer that is not suited for playing videos of a certain quality. The Google Chrome extension h264ify aims to improve the YouTube experience on low performance systems by switching from YouTube's VP8/VP9 encoded videos to H.264 encoded videos instead. One of the core reasons for playback issues on YouTube is the default video format according to the author of the extension as VP8/VP9 is "not typically hardware accelerated". What this means is that cpu is used to play these videos which is problematic on low-end systems for obvious reasons. The switch to H.264 on the other hand ensures on many systems that hardware acceleration can be used which means that the GPU (video card) is being used for the heavy lifting. The result: a smoother video experience and reduced cpu usage. The extension works right after installation. You can check that easily by right-clicking on the YouTube video and selecting "stats for nerds" from the context menu. 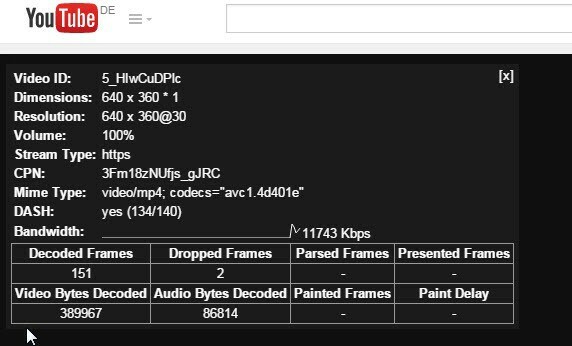 Check the mime type line there: if you see video/mp4 it is working fine and streaming H.264 encoded videos. Without the extension you will see video/webm instead indicating that VP8/VP9 encoded videos are streamed. Please note that this works only if the HMTL5 player is being used to play videos and not if Adobe Flash is used. There is obviously no guarantee that it will resolve issues for all YouTube users who experience them. If you do use Chrome on the other hand and experience video streaming issues on YouTube, you may want to give this a shot. The worst that can happen is that it won't resolve the issue you are experiencing. Chance is there however that it will improve video streams on the site for you. Considering that it takes a couple of minutes to test, it should be well worth the attempt. Is there a similar extension that can ease the YT viewing experience in Mozilla??? YouTube playback performance is a more complicated thing than it seems. Even if YouTube debug screen does not show dropped frames, frame drop usually still occurs in most browsers. I tested many browsers and Flash/HTML5 player combinations on many systems and found that only Internet Explorer+HTML5 plays videos almost perfectly. Other browsers HTML5 or Flash, and IE+Flash drop frames. Google “30fps judder test” video, and run it in fullscreen 1080p. For some reason Chrome and Firefox are unable to play this video smoothly. (Firefox does not yet officially support HTML5 1080p, but if you enable media source extensions, it will). I suspect it has nothing to do with CPU performance, it’s rather a frame/screen refresh sync issue. This has resolved annoying dropped frames and jerky playback at 1080p which was driving me nuts since getting a faster connection well able to play 1080p.